Adobe Photoshop Training in Chandigarh – Are you planning to join Adobe Photoshop Training in Chandigarh? Do you like to add effects to photos and make them one of a kind? Are you searching for your career in Photoshop? Ask yourself the questions and if you get the answer in affirmative, you need to do something about it. The best way is to learn Adobe Photoshop Course. From this course, you will obtain knowledge of various ways of designing and the way to make a photo in a different style. Adobe Photoshop is a Graphics image editing program that is used ubiquitously in the world of Design, Filmmaking, Photography, and Print. Adobe Photoshop CS6 and Adobe Photoshop CC are the latest versions of the software present on the Market with Creative Clouds Options. iNFOWIZ is a leading institute in India providing unmatched training solutions in Photoshop CC. An Adobe Photoshop course that would teach it’s students all the tools and functionality of the Adobe Photoshop software in order to use it for designing, editing, simulation, and Manipulation. Adobe Photoshop is the most Advance Designing Software to learn. Learning Complete Software with every 100% command with its options make a student perfect in all kind of Raster Designs. While learning commands and options Infowiz Software Solutions also provide students with Daily Skill Assessment Practice with Practical Projects and students also get a chance to work on Live Projects. Would you like to learn how to use the world’s most popular graphics and photo editing software with ease? Infowiz is one of the Best Photoshop Institutes in Chandigarh which offers highly advanced and Professional Adobe Photoshop Training in Chandigarh. We are not giving only the basics training for Photoshop rather we make our students work on various projects which give them hands-on experience on photo retouching, image editing, text effects, cut-outs, patterns, background designing, image manipulations, and lay outing. Photoshop offers you many opportunities to make your images look great and eye-catchy as it is the only image editing application that is used to manipulate and enhance your digital photographs and images. Who can Join Adobe Photoshop Course in Our Institute? Absolutely no experience is required. The course demonstrates you exactly how to work with Photoshop and become an expert! Anybody who has an interest in image editing, collage making, image manipulation and making various effects. Vanishing Points, HDR Images, Panorama etc. 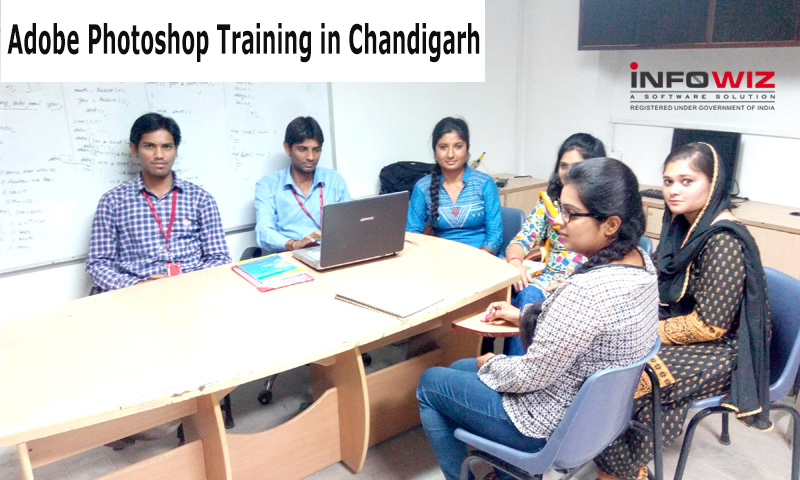 Why Infowiz for Adobe Photoshop Training in Chandigarh? Conduct Best Student of the Month Award every month to boost the competitiveness at the center among the students.